There's a reason that the Globe Supreme 14" Structural Pull-On Fire boots continue to remain a popular, sought-after choice for the firefighter. They're ranked a 4.8 out of 5 by our reviewers and 96% of wearers would recommend them to a friend. They're not deemed, "The most comfortable boots you will ever wear" for no reason. They boast the sneaker-like feel that make them a popular choice. The highly flexible material can endure up to 1,000,000 flexes with zero compromise in performance. There's a multi-layer composite puncture protection insole, and a 3D-molded shin guard which protects you when you're on a ladder. The included Snug-Fit inserts give that extra boost to customize your comfort level. The special CROSSTECH moisture barrier provides unmatched protection, and the composite-safety toe keeps you protected if heavy objects fall. The simple fact of the matter is: Globe designed these boots to be an exceptional option to bridge the gap between ultimate comfort and ultimate protection. Quite simply, they're designed to help you do your job easier, from start to finish. 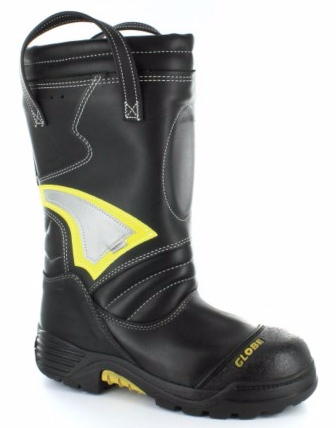 For more details on these great boots, visit us on TheFireStore.com.